Running to Catch Up on World Cheetah Day! On this World Cheetah Day, I’m sprinting to get this out in time… and sharing a quick field sketch of 2 hunting cheetahs from my recent trip to Botswana. The sketch was created in pencil then the watercolor was added once I returned to camp (without reference to photos or video). In the spirit of sketching the fastest land mammal, it was all done very fast! Below you’ll find links to some great cheetah conservation organizations. Hurry up and check them out! They all deserve your support to help conserve cheetahs and the habitat they need to thrive! This entry was posted in African Wildlife, Big Cats, Blog Posts, Conservation, Field Sketches, Watercolors and tagged African cheetah art, alison nicholls art, big cat art, Botswana sketch, cheetah art on December 4, 2015 by Alison. These are the same male cheetahs who featured in my sketch Creepers & Cheetahs earlier in this series. This sketch was created while I watched them scouring the bush for impala or other prey. They took their time and I was able to sketch both cheetahs as well as the tree and termite mound. I could have followed them all day, as not only were they very handsome boys, but they kept choosing the most scenic of locations, perfect for a field sketch artist! The Original Field Sketch is watercolor & pencil on watercolor paper, 11×14″, priced at US$300. Limited Edition Giclées are also available, priced at US$120 each. Only 10 copies are available, printed using archival inks on watercolor paper, 14×11″, all signed and numbered by me. Tomorrow’s sketch is of a buffalo herd. 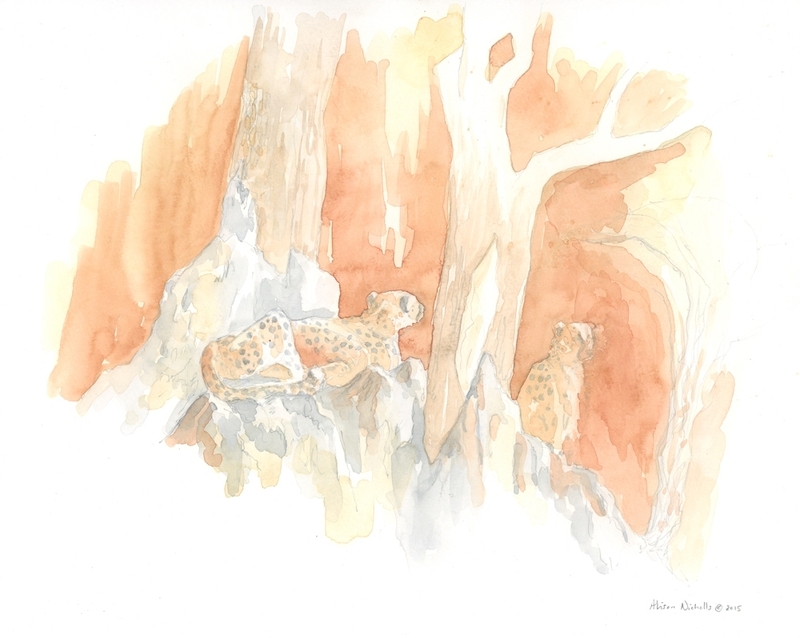 This entry was posted in African Wildlife, Big Cats, Blog Posts, Field Sketches, For Artists, Watercolors and tagged #africanwildlifesketch, African cheetah art, alison nicholls art, cheetah sketch, cheetah watercolor on November 14, 2015 by Alison.